There’s a sense of focused, purposeful design that you get when you kick the tires on Dell’s Precision T3610 midrange workstation. The attention to fit and finish, especially inside the case, is outstanding. You see that with a lot of major vendors in the workstation market, of course, but the T3610 takes it up a notch compared with a workstation like HP’s Z230 Tower. 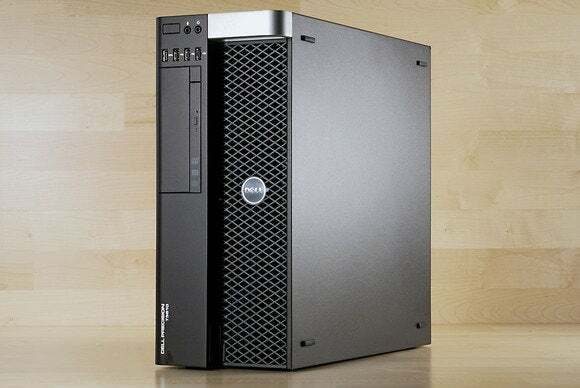 Dell sells the Precision T3610 in eight configurations, starting with a $1100 model featuring a 3GHz quad-core Intel Xeon E5-1607 CPU; a 512MB Nvidia Quadro NVS 310 graphics card; 4GB of non-ECC (error-correcting code), DDR3/1600 memory; and a 500GB, 7200-rpm hard drive. The top-of-the-line configuration we tested costs $2210 and consists of a 3.7GHz quad-core Xeon E5-1650 processor; a 3GB Nvidia Quadro K4000 graphics card; 16GB of ECC DDR3/1866 memory; and a 1TB, 7200-rpm hard drive. Dell’s Precision T3610 features impressive fit and finish. AMD FirePro graphics boards are also available, and the motherboard supports up to 128GB of memory, but you get no solid-state drive option. And unless you’re a Premier customer buying in bulk, you’re restricted to one of the eight somewhat limited configurations Dell offers, or you can buy one and upgrade it yourself. Back to the T3610’s outstanding design. The midsize-tower case is especially sturdy, and a handle is integrated into the front of the unit for easier lugging. The power supply is mounted at the bottom of the case for better stability. The unit runs quietly even with plenty of airflow though it. The memory is situated inside tunnels that allow air to pass across the DIMMs, with waste heat whisked directly out of the unit so that it can’t affect other components. Same deal with the CPU. The T3610 channels cooling air over critical components, and ensures that warm air is exhausted outside the enclosure. The system has two side-facing 3.5-inch drive bays with slide-in trays, plus two vertically oriented, externally accessible 5.25-inch drive bays. One of these harbors the system’s half-height 8X DVD burner. The side panel detaches easily when the center-mounted latch is disengaged, and a beefy chassis-intrusion switch is available to blow the whistle on unauthorized access when said feature is enabled. The motherboard has plenty of expansion slots: two PCIe 3.0 x16, one PCIe 3.0 x8/x16, one PCIe 2.0 x4, one PCIe 2.0 x1, and a legacy PCI 32 slot. It also offers six SATA ports: four 6Gb/s and two 3Gb/s. On the front you’ll find one USB 3.0 port and three USB 2.0 ports. The back serves up another three USB 3.0 ports, as well as a whopping five USB 2.0 ports. If that’s not enough, two additional USB 2.0 headers are on the motherboard. A serial port, a gigabit ethernet connection, and legacy PS/2 keyboard and mouse ports reside in back as well. 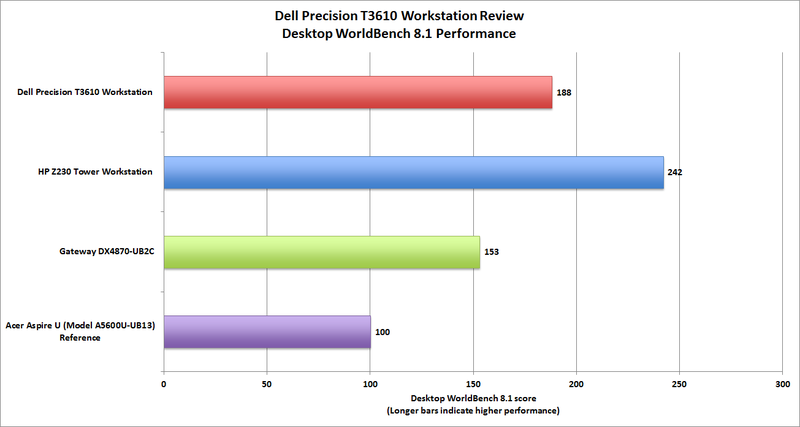 Bearing in mind that PCWorld’s WorldBench 8.1 test suite isn’t designed for workstations, which are focused on math and CAD, the T3610’s score of 188 is solid. Our E5-1650–based system came with Windows 7 Professional, as do all the configurations I saw online. Windows 7 Ultimate, Windows 8 Ultimate, and Red Hat 8.5 Enterprise are available, but again only to Premier customers on bulk orders. The lower-priced T3610 configurations come with a standard one-year warranty, and the high-end version we tested is covered for three years. You’ll find all the service options you could wish for, though: The price is $172 for the basic five-year on-site plan, or $301 for on-site service with 24/7 phone support and assistance with software issues. You won’t regret a Precision T3610 purchase once you see the attention to detail that Dell has put into it, assuming that you’re a Premier customer and/or you find a configuration that suits you. If one of the eight available doesn’t fill the bill, check out Dell’s other workstation lines. The Precision T3610 is well designed and attractively priced.